James Dobson may be the only Evangelical whose Sunday school teacher apparently never warned him to be careful what he prayed for. Two weeks before Election Day, the Focus on the Family founder chatted with Sarah Palin on his radio show and shared his backup plan for the struggling GOP ticket. He was, Dobson told her, praying for "God's intervention" and that "God's perfect will be done on November the 4th." Unless Dobson has undergone a dramatic political conversion, it's safe to assume he does not consider Barack Obama's election on Tuesday to be divinely ordained. In June, Dobson delivered a furious broadside against the Democrat, charging that he was "deliberately distorting the traditional understanding of the Bible to fit his own world view." And yet in a year in which the economy mattered more than social issues for most voters, Obama's comfortable victory included Democratic gains in every single religious category among the electorate. See pictures of presidential First Dogs. John McCain's selection of Palin, a former Pentecostal Christian, as his running mate was supposed to help strengthen his appeal to religious voters. Republican strategists knew that undecided religious voters broke heavily for George W. Bush in the last weeks of the 2004 campaign, and they hoped Palin's candidacy would sway those voters to the GOP again this year. Instead, those late deciders  including white Evangelicals  appear to have split between Obama and McCain. Nationally, Obama captured 53% of the Catholic vote, a 13-point swing from 2004 and the largest advantage among the group for a Democrat since Bill Clinton. Obama also cut in half the Republican advantage among Protestants. And he made significant gains among regular worship attenders. 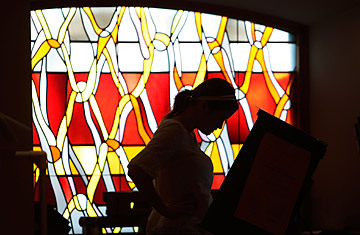 Voters who attend religious services most frequently are still most likely to cast ballots for Republicans. But Obama won 44% of their votes, a 19-point shift in the category that, after the last presidential contest, inspired pundits to diagnose the existence of a "God gap." Voters who worship at least once a month preferred Obama 53% to McCain's 46%. As in 2006, the least-religious Americans continue to reject the GOP in large numbers. Voters who say they visit houses of worship just a few times a year or not at all made up 44% of the electorate in this election. They gave Obama 59% and 68% of their votes, respectively; both totals represent double-digit increases from four years ago. And yet despite the inroads Obama made with religious constituencies, there is one voting bloc that remains largely unmoved by Obamamania: white Evangelicals. One-quarter of them voted for Obama on Tuesday  despite a warning from conservative columnist Janet Porter that they could be risking their eternal souls by doing so  an improvement on John Kerry's dismal showing in 2004. But against a candidate like McCain, who is famously disliked by many Evangelicals, in a campaign in which Democrats engaged in a record level of outreach to Evangelicals, and at a time when the Evangelical community is expanding its consciousness to focus on traditionally Democratic issues like the environment and poverty, this would have been the year for a real shift of support to take place. So why didn't that happen? See world leaders react to Obama's win. Read "10 Things That Never Happened in a Campaign Before."